As you would have noticed the IOTA contest was on over the last 24 Hrs. For the first time ever I decide to have a go away from home, and see what I could work in 12 Hrs. Honda 2K Generator,, 2E Quad. Having just returned from Scotland, I decided it was about time to dust off the 20m Quad antenna and do some QRO with John M0UKD. The antenna has undergone a few modifications since the #1 version last year. The mounting plates for the roach poles are now heavy duty aluminium. 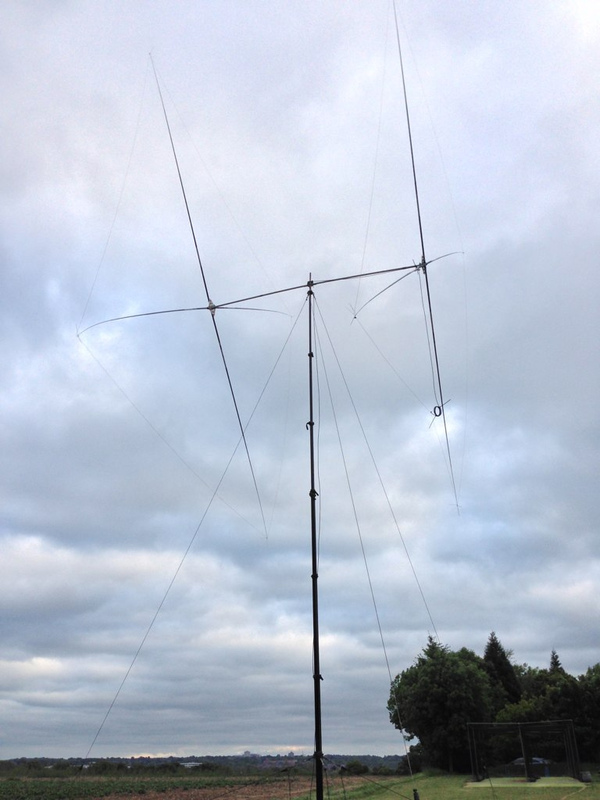 The plan last night was to setup the Quad and try out a new mast (12m [40ft] Racal push up mast) with the antenna. The antenna assembly takes a while, as the antenna was designed to be portable, with everything fitting into the car in preparation for HF portable. Power would be provided by the Honda generator, and so this would enable me to take the Linear Amp and run QRO with 400w. The plan was to use a leisure battery to run the radio, allowing the generator to breath and deliver the linear as required. The generator would be capable of doing both, but I have the battery here and it seems logical to give the genny some headroom. Working portable from any location is always fun, but today I got the chance to work /p from the highlands of Scotland in the sun. The equipment was my basic portable setup, Icom 7000, 85 Ah battery, 12m roach pole and 24m (12m per leg) doublet. The operating location was Ullapool on the West coast of Scotland. I settled on a rural lay-by close to the A835 around 5 miles North of Ullapool, room for the doublet and away from the public. I setup on 7 MHz, and quickly joined M0UKD John for a chat, the signal as expected was a push on 7 MHz with 5-5 to 5-7 from John. The noise level at my side was zero, so the signal to noise on everyone was very good. I operated for 2.5 Hrs and worked 26 stations on 7 MHz including Brian M0OAB and Wayne G4YOH from LEFARS. Having never worked from this far North I was surprised I could work into London, most of the stations I worked were from the Midlands, Cheshire, Runcorn, Leeds, Wolverhampton, Liverpool. The operating location can be seen on Google Maps and more photos can be seen on Dave’s Flickr Set.